Make your Wake a WAVE! Shape your wake LONGER and TALLER! Now with the new Float! Keeps your gate floating if it detaches from the boat. 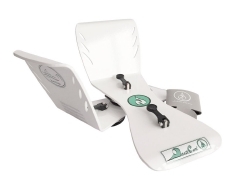 The Nauticurl Aftermarket Surf Gate shifts the water flow behind the boat creating a wave ideal for an effortless ride.